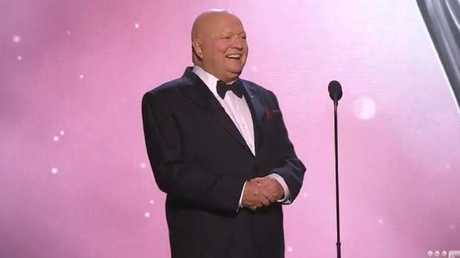 IT WAS the moment that left Logies viewers and celebrity guests cringing: Bert Newton, fresh from a standing ovation, joking that Graham Kennedy had "mentored" interns behind locked doors - wink wink, nudge nudge. 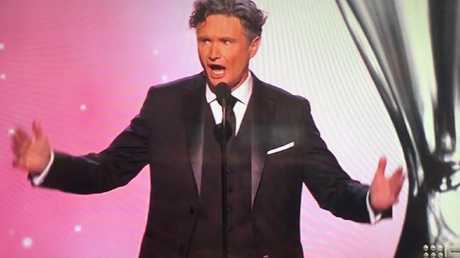 They'd rescued Dave Hughes from an earlier "I love Don Burke" mishap, but Logies presenters Hamish Blake and Andy Lee were left shocked by Newton's unfortunate gag. 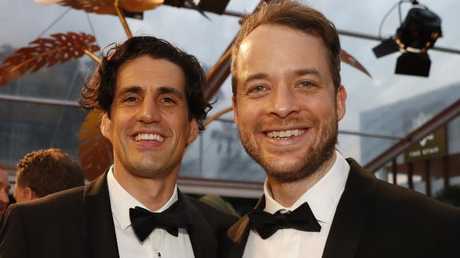 "The thing is, in my opinion, he's absolutely said the wrong thing," Andy revealed on The Australian's podcast, Behind The Media, recorded the morning after this year's Logies. 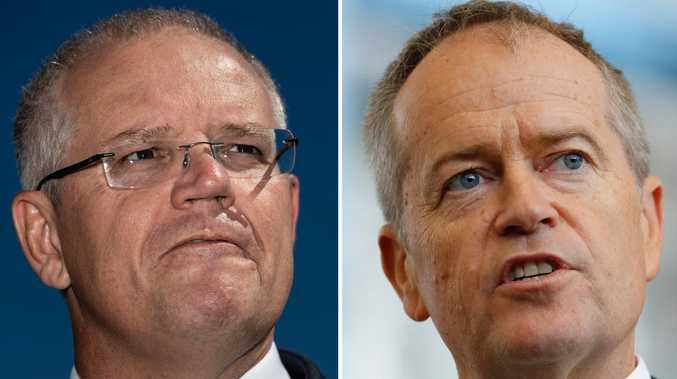 "Even if it's a joke, it's not a joke that we have these days - and I don't even subscribe to the, 'Oh back in those days it was fine' - it's like, 'Nup.' We've got a new standard, and he missed the mark." During his speech, Newton was remembering his late friend Graham Kennedy when he offered up an innuendo-laden anecdote about the TV legend. "He enjoyed giving young people a chance on television. He was a great mentor, he mentored a lot of young people. You knew if you went to his dressing room and it was locked, he would be inside doing some mentoring," he said, an eyebrow raised, as the audience gasped. In the interview with Behind The Media, Hamish described seeing "someone like Bert" at the centre of a situation like that as "very, very sad". "There's no other way to put it: he made a terrible, really poorly thought-out, bad comment. We didn't know what he was thinking." However, Andy also pointed out that the moment wouldn't "stain Bert forever" - and that it actually provided a good opportunity to "educate him, or educate others, on why it was the wrong thing to say". Early in the evening at the Logies, the comedy duo - along with everyone else watching the event - had also been left stunned as Hughesy repeatedly told the audience that he "loves" disgraced former Burke's Backyard host Don Burke. "Give it up for Tracy Grimshaw, guys. Thirty years, nominated for gold. And also her Don Burke interview has been nominated as well. That was amazing. We have a lot of revelations from that. We got the revelation that Don apparently has Asperger's. No-one knew about that. Including his doctor. No, I love Don Burke. I love Don." At this point, with the audience groaning, Hughesy backtracked about his "love" for Don Burke, who faced a slew of allegations about sexual harassment and inappropriate behaviour throughout his career last year. "I don't love everything about him. All right? Now I've taken myself to weird zone. Sorry." 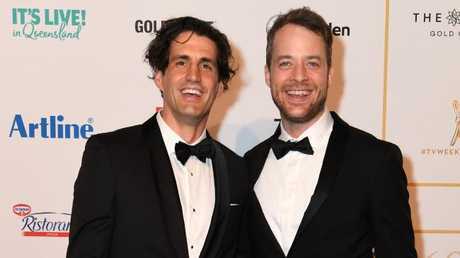 Later on, Hamish and Andy discussed the gaffe on stage while presenting an award. "We did just have a chat to Hughesy out the back. He would like us to clear up one detail: He does not love Don Burke. In fact, I don't know if we have got any of the cricket instant replay, but I think he said it four times. The old, 'I'm Hughesy and I will say I love the person I'm having a go at', it has never backfired before and it did in that instance." Speaking on the podcast, the True Stories hosts described what had actually happened with Hughesy backstage in the lead-up to their clarification. "We offered [to clear it up]. We were laughing. He came off stage and I went up to him and he went, 'I just said I love Don Burke,' and then he burst into tears laughing in a weird kind of hysteria," Andy said. "It was manic. I was like, 'Did you have an out-of-body experience? Did it occur to you that were standing on stage at the Logies, coast-to-coast live, no delay, saying - more than once - 'I love Don Burke'?" Hamish remembered. "He said, 'I know'. And we said 'but you don't like Don Burke' and he goes, 'I don't love Don Burke, that's right,' so I was like, "Can we go out there at the top and say, 'We'd like to clear it up?' and he goes, 'Yes please!'" Hamish added that they'd both found it "hilarious". "The reason it was funny is because his openers are stellar - he never misses - and for years now, he's just never missed … It's like Ronaldo missing an open goal, like it's just so funny to see a guy who's so good just accidentally say the wrong thing. "I don't think I've ever seen him laugh so much." Speaking to news.com.au on the night (shortly after that opening gaffe), Hughesy confirmed that he "didn't f***ing mean" to say it. "I don't know what happened, I don't know what happened with Don Burke. As I was saying I loved Don Burke for about the fourth time, I thought 'Why am I saying I love Don Burke? That's not going to read well. That's not going to play well. That's not the case,'" he said. "People remember when you lose your mind and I lost my mind."